DETROIT RUNNER....: The Crim is coming!!!! 7 miler on the schedule today. Done. Seemed kind of hard today but my pacing was pretty good overall. I was also able to run in full sunlight since I have the day off today. If you have not entered my contest yet, don't forget that it ends tomorrow. You have a great chance to win a pair of headphones for running, working out, etc. Click HERE to enter. Love the medal and that they put your name on the bib! I can't remember how many people were there - something like 30,000. It was crazy yet really fun. This is also a challenging course with hills including the famous Bradley Hills. Hopefully we will get lucky again this year and have great weather. It was cooler than normal last year and as you can see, nice and sunny! There is also bands throughout the course and people from the neighborhoods come out and support the runners and put out their stereos as well. They also had a great expo for a 10 mile race. Last year I picked up my packet the day before because I had an appointment with a client in the area but probably not this year so I will be getting there pretty early. This year the race will also be celebrating it's 35th year!!!! It will be incredible to be there for that. This race started when I was seven years old! Haha! There are people from across the country that run in this with many elites as well. $5,000 bucks if you can nab first place! Question of the day: Anyone running this race this year? That is a crazy big field for a 10 miler! 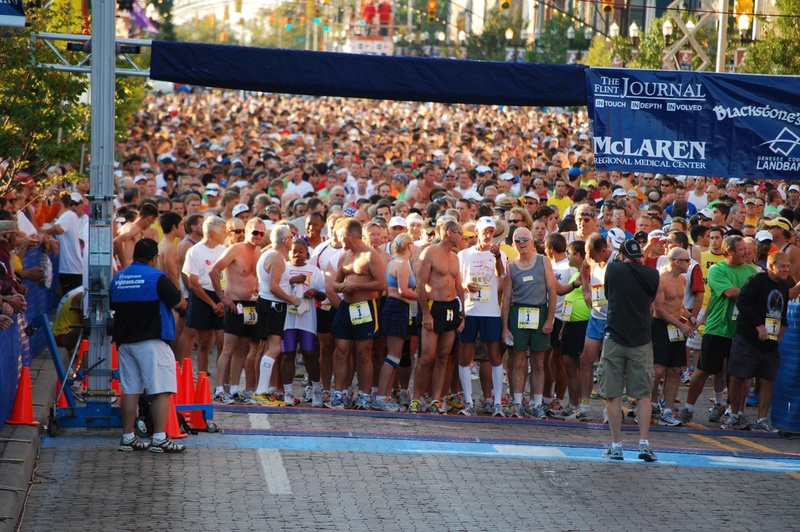 You must run crowded from start to finish. Have a good weekend! I'm so jealous! I signed up for this last year but was injured so I had to defer my entry to this year and obviously I'm not even running yet so it's out again. I did spectate Spike running it last year though and the race is a great one. So organized and the swag is pretty awesome. Good luck! I am not running this race. I have a party to attend that day and an 18 mile run on schedule. Good Luck!! I heart the Crim! I'm somewhere in that sea of people as well!! 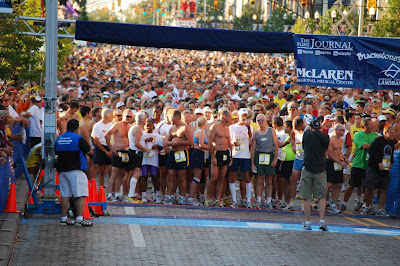 The spectators were the best spectators I've ever seen in a race and it was well organized. I'll definitely be running that race again. Johann - Yes, pretty crowded but only really crowded the first mile. Steph - I have the same 18 on schedule for Sunday after this race. I am going to cut it back to 16 though. Jess - awesome. This year? wow that is a HUGE race for a 10-miler. good luck and enjoy! Jeff I'll be there with my cooler for the after-party! That looks awesome (aside from getting up so early!). I'm running a 10 miler this weekend. It's my first race that distance. Yay automatic PR! I love this race - one of my favorites of the whole season. I'll be there for the 10 miler this year @ 20 weeks pregnant! 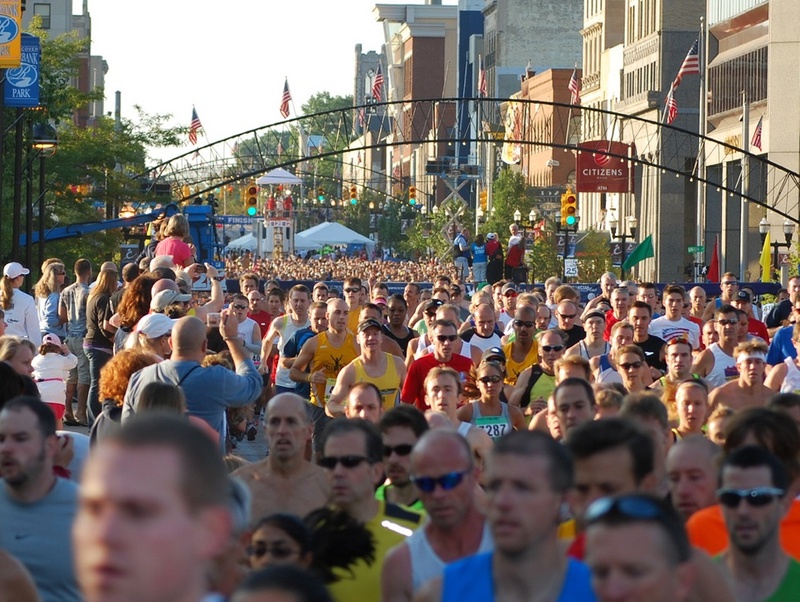 Wow, That sure is a lot of people for a 10 mile race. But for $5000 I can see why! The name being on the bib is definitely cool!! I was there last year and the course beat me up! But I can't wait to get back this year and show it who's boss! I'm heading up on Friday and staying the night since it's well over an hour from my house (and I'm shopping at Birch Run too). The course support and entertainment rivals the Detroit Marathon I think - it's awesome!